Land & Water is an award-winning marine-based civil engineering and dredging group of companies whose expertise covers the design and construction of aquatic or wet civil engineering projects from ornamental lakes and ponds to marinas and complete waterways. Working both in fresh and salt water environments it has three very distinct phone users – those that are predominantly office based, those that are on the road and those that are working from remote customer sites in the UK. Land & Water had reached the stage where it operated three separate phone systems supported by seven separate suppliers. Lost calls were common place and systems problems often meant the entire company being without phones for 1-2 days with Land & Water unsure who to call to solve individual problems due to a fragmented supplier base. “In 2013 it had reached the stage where we had become completely disenchanted with the telecommunications industry – our systems plainly weren’t working and were costing the company time and money just to keep them maintained at a basic level. Three separate systems served our head office in Surrey and three regional offices in Scotland, Derbyshire and Norfolk. Land & Water had three separate types of phone user – head office staff who used both landline and mobile, employees that are on the road travelling between its offices and customer locations, and site operators who were on site 100% of the time. 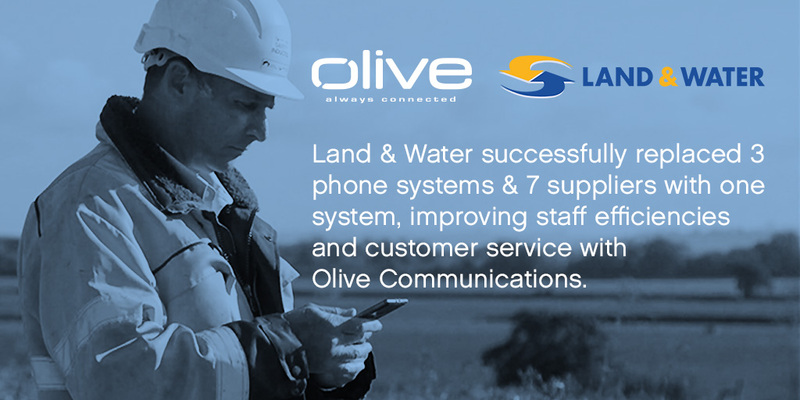 After a complete telecoms review Land & Water appointed Olive Communications in 2015 to install a fully converged solution in the shape of Vodafone One Net, which serves both fixed line and mobile users as part of a five year contract. Within just five weeks Vodafone One Net had been successfully implemented across 137 phone users with just some minor cabling updates necessary at our regional office in Derbyshire. Users have been issued with different handsets based on levels of landline and mobile usage with the site managers who only use their phones occasionally being equipped with a more basic set than the other two user groups. One Net provides all users with a single voicemail box which makes missed messages a thing of the past, a massive step on from our previous systems. A central phone directory also means staying in touch with colleagues is easy wherever they are based around the group. The system has already surpassed our expectations allowing us to concentrate on our core business safe in the knowledge that our telecoms needs are being proactively managed by Olive Communications. “Ours is a fast moving business and effective communication means we can now react to changes in a client’s needs quickly and efficiently without wasting time or money.